MVA: Makelaars Vereniging Amsterdam (Association of Real-Estate agents of Amsterdam). NVM: ‘Nederlandse Vereniging van Makelaars’ (National association of Dutch real-estate agents). 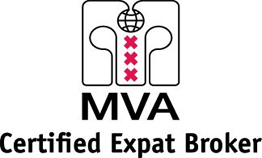 As a MVA ‘Certified Expat Broker’ and we are a partner of the ‘Expat Center Amsterdam’. Renthouse International is a member of the NVM; ‘Nederlandse Vereniging van Makelaars’ (Dutch association of real-estate agents). Up-to-date knowledge; all NVM agents must attend mandatory trainings/classes each quarter to ensure all possess the latest changes in the law and regulations. Renthouse has been operating for almost 50 years a market leader in quality rental homes in Amsterdam, AMstelveen and Haarlem.